To undertake peaceful application of nuclear science and technology in research to effectively and efficiently to address the needs of the industry and promote innovation . Nuclear Energy Applications and Analytical Services is one of the program offered at the National Institute for Scientific and Industrial Research Head qaurters. The mandate of the programme is to conduct scientific research using nuclear analytical techniques and application of nuclear technology. 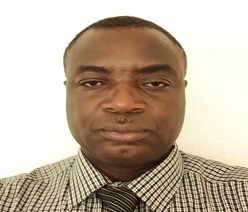 The programme is specialized in Radiometric and Nuclear Analytical Techniques (EDXRF, Gamma Spectrometry, Alpha Spectrometry, Radon monitoring & Fast Neutron Activation Analysis)& Radiation processing (Co-60 & Cs-137). Used for radon gas measurements. The naturally radioactive noble gas radon (222Rn) is present in the air outdoors and in all buildings including workplaces. It is thus an inescapable source of radiation exposure both at home and at work. 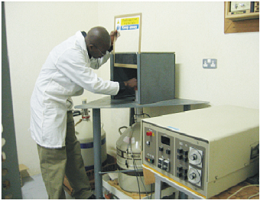 The spectrometer uses a High Purity Germanium Detec-tor (HpGe) to measure low level radioactivity in a wider range of materials including: environmental samples (Water, soils and sediments), biological samples, food-stuffs (grains and cereals, milk) and geological samples (mineral ore). 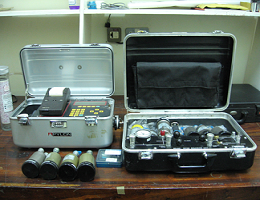 XRF is a non-destructive multi-elemental analytical technique which employs excitation of samples using radioisotopes (gamma emitters) or X-ray generators. Industrial application mining, cement, oil, polymers, plastics, forensics, mining and mineralogy, and geology. For environmental analysis, XRF can be used to assess heavy metal pollution of water and air. XRF is also widely used in glass and ceramics research and pharmacy. Analysis of non-metals such as nitrates, sulphates, phosphates and other salts in various environmental constituencies. Irradiation services of various material for sterilization, shelve life extension, mutation or different purposes depending on the needs of a client. To promote peaceful application of nuclear energy in research and other developmental activities. 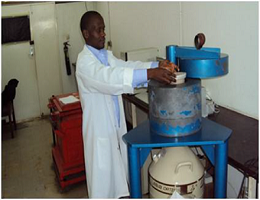 To contribute towards the provision of radiological safety and radiation protection.